Phase-coherent signals are required for device testing in many applications in various industries. Multiple test signals involve a number of signal sources which need to be synchronized. A key characteristic of such a phase-coherent system is its phase stability. Sharing a common local oscillator (LO) signal is the method of choice to achieve excellent phase stability of multiple signal sources up to the microwave frequency range. However, most signal sources do not provide a standard LO interface and therefore require additional hardware and software expenditures. On the other hand, all signal generators typically offer a standard 10 MHz reference input and output for synchronization purposes. Such a 10 MHz reference oscillator signal can also be shared between different signal generators. But in most cases, the achievable phase stability is insufficient for phase-coherent applications. 1 GHz versus 10 MHz reference coupling: The phase stability of 1 GHz reference coupling (blue) is significantly better than 10 MHz coupling (orange) at 6 GHz RF output and constant temperature over 90 minutes. 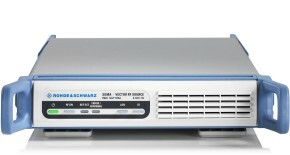 The compact R&S®SGT100A SGMA vector RF source from Rohde&Schwarz provides not only a 10 MHz reference, but also an additional 1 GHz reference as standard. 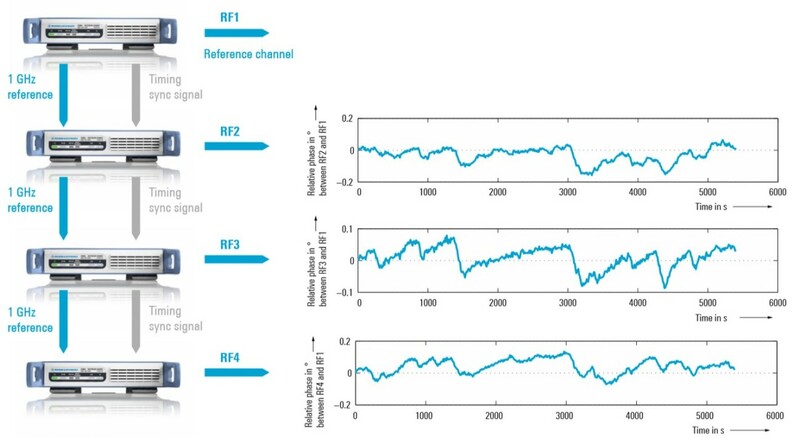 Compared to 10 MHz, a 1 GHz reference signal significantly improves the achievable phase stability between two signal sources. 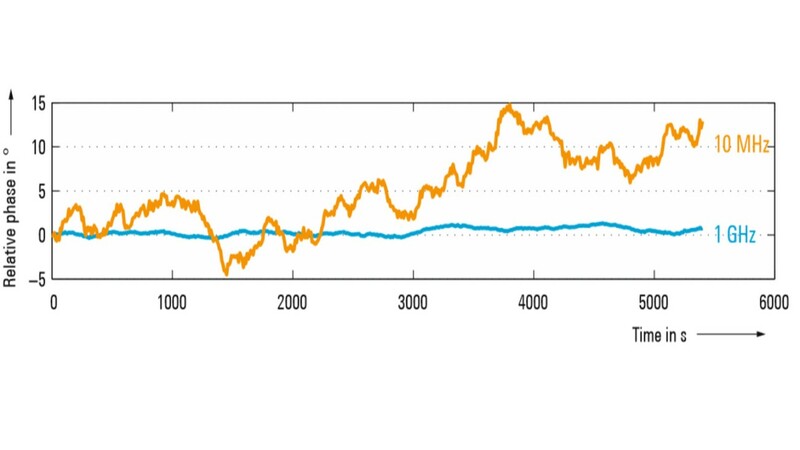 Because the synchronization increases by a factor of 100, the relative phase fluctuations between the sources can be reduced. 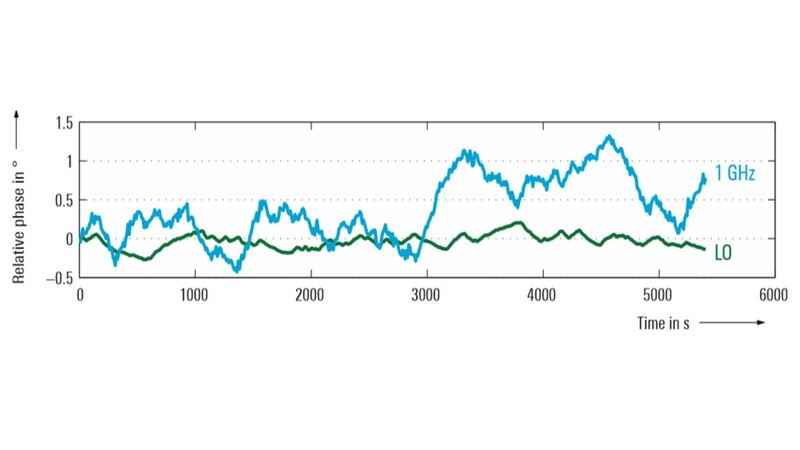 1 GHz reference versus LO coupling: The phase stability of 1 GHz reference coupling (blue) is close to LO coupling (green) at 6 GHz RF output and constant temperature over 90 minutes. The achievable results when using a 1 GHz reference are close to the excellent phase stability achievable with LO coupling, especially for short-term measurements. Reference coupling is also required for phase-coherent systems with different RF output frequencies since LO coupled systems only support identical RF frequencies. The 1 GHz reference of the R&S®SGT100A makes it possible to achieve excellent phase stability for such applications where phase-coherence with different RF frequencies is required. 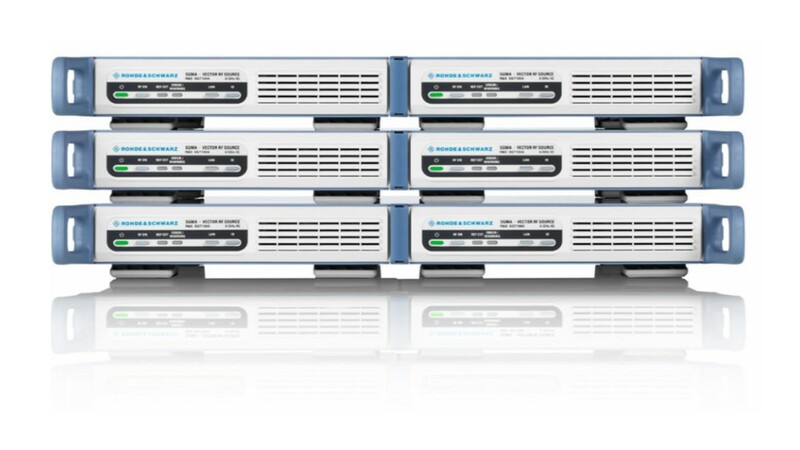 The R&S®SGT100A is a compact and cost-efficient solution for phase-coherent systems up to 6 GHz..